The Large Synoptic Survey Telescope (LSST) is a wide-field survey reflecting telescope with an 8.4-meter primary mirror, currently under construction, that will photograph the entire available sky every few nights. The telescope uses a novel 3-mirror design which delivers sharp images over a very wide 3.5-degree diameter field of view, feeding a 3.2-gigapixel CCD imaging camera, the largest digital camera ever constructed. 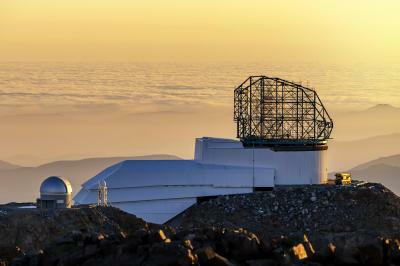 The telescope will be located on the El Penon peak of Cerro Pachon, a 2,682-meter-high mountain in Coquimbo Region, in northern Chile, alongside the existing Gemini South and Southern Astrophysical Research Telescopes. The LSST was the top-ranked large ground-based project in the 2010 Astrophysics Decadal Survey. The project officially began construction 1 August 2014 when the National Science Foundation (NSF) authorized the FY2014 portion ($27.5 million) of its construction budget. The ceremonial laying of the first stone was performed on 14 April 2015. Site construction began on April 14, 2015, with engineering first light anticipated in 2019, science first light in 2021, and full operations for a ten-year survey commencing in January 2022.